Virtual reality (VR) experiences along the Wild Atlantic Way can now be accessed publicly via apps or on desktops. Launched by Fáilte Ireland, the tourism promoter also unveiled is a new 360° views of the Wild Atlantic Way, which will add another level of immersion when visitors research the destination. 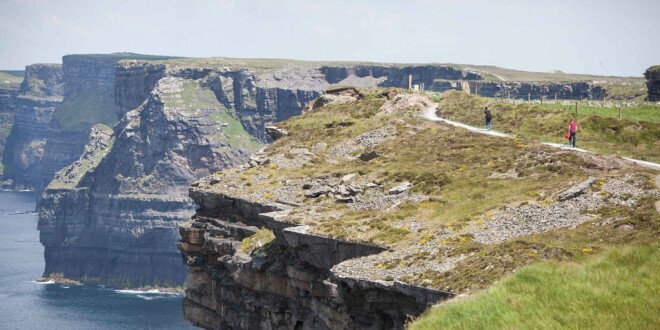 Already the first of the 360° videos promoted publicly, Surfing at the Cliffs of Moher, has generated 150,000 views amongst potential visitors. Fáilte Ireland recently piloted VR as a potential sales tool at ITB Berlin, one of the world’s largest tourism trade fairs with 10,000 exhibitors from 187 countries and territories and with approximately 100,000 international trade visitors and members of the public in attendance. Following on from the successful demonstration to the international trade, Failte Ireland are now giving everyone the chance to view the experiences for themselves. A number of exciting activities (surfing under the Cliffs of Moher; sea stack climbing; beach horse riding; and cycling along the Wild Atlantic Way) are now all available on virtual reality apps including LittleStar and Samsung Milk VR. The experiences can also be viewed in new 360° videos which allow viewers to tap, click or drag the video to change their viewing angle and see what’s happening around them giving the viewer an almost life like experience. These cutting edge views are available across all Wild Atlantic Way digital platforms including www.WildAtlanticWay.com as well as across social media channels including Facebook and YouTube.